Bob, that Despicable Me Minion mixed with a Martian in the photo, floats at the boundary of space, high above planet Kerbin. The space ship he was in, falls back to the planet below him. Bob ponders how he got in such a predicament, floating in space with no way home. The answer: he trusted me. Turns out, I’m a bad rocket scientist. But don’t worry about Bob, he’ll be fine. These guys are indestructible and I’ve got a mission on the way to retrieve the little guy already, assuming that one doesn’t fail too. Welcome to the game Kerbal Space Program where you get to run your own space agency and decide everything from mission parameters to the design of the ships. It’s as much fun to fail as it is to succeed. Kerbal Space Program gives you an inside view on what it is like to build and fly your own rockets. It is similar to Sim City, but with rockets, space, and everything included. It is a virtual space race at your fingertips. “Mission Control, we have a problem.” Credit: Squad, Monkey Squad S.A de C.V.
For Kerbal’s creator, Felipe Falanghe – the game’s idea was born out of a simple pitch to create a simple 2D game that would launch a spacecraft as high as possible to rack up points and beat high scores. The project started out small, but as any great project starts, the idea was so solid that its future was limitless. The game evolved to something bigger, with players creating mods of their own. As it became more fun and accessible for all, in 2011 Squad, the company behind it, released the game to the public. Loosely, the goal of the game is for players to build rockets and space planes with the supplies provided so that they can explore space after successfully getting their rocket to launch off the home planet. The level of difficulty involved in these missions is determined by the player and can range from very simple to extremely difficult. The game puts your brain to the test with a steep learning curve and a variety of things you will need to keep an eye on as the administrator of your own space squad. First you need the basics: launch a rocket. Then try getting one to space without blowing up. Then try to get to the Kerbal moon and so on. Each stage adds difficulty, but also begs for creativity and innovation. A person with zero engineering experience might have an out-of-the-box design that might actually work and could change the future of rocket engineering. In Kerbal Space Program, your home planet is called Kerbin, and there are two moons in orbit. Credit: Squad, Monkey Squad S.A de C.V. The idea is that any person can play the game and find their place within all the features it has to offer. Failures and successes are even equally rewarding, sometimes. The idea for this game has gestated since Falanghe was an imaginative teen, launching toy soldiers with spare parts and fireworks. “The most successful design we had was a two-stage rocket that actually ignited the second stage. It was glorious”, Falanghe told Andrew Groen during an interview. Who hasn’t tried to launch an Army Man with a bottle rocket, hoping to see the parachute deploy as it floats back to earth, assuming it didn’t blow up and that it even made it off the ground? Flange had a dream to launch his little tin men to space. Well, that didn’t work out too well at the time. But the idea stayed with him. That dream, the fun of trying to achieve something big with so little, never getting discouraged, but simply asking why drove Falanghe. If it didn’t work, why? Try to solve one problem at a time and eventually something will work. Then try to go bigger. That is the heart behind this game, and part of the credit needs to go to the company Falanghe works for. His dream remained nothing more than a dream until Squad launched a new campaign of their own. “Make your dream come true” was a program for it’s employees where they could present any idea they had to the company and if the bosses liked it, they’d come on board and help to realize that dream if possible. Conduct your own Apollo mission in KSP by launching a rocket to the moons Mun or Minmus. Credit: Squad, Monkey Squad S.A de C.V. Remember, Squad was a marketing company. They have no experience in the world of video games. So to take on something so out of their field was ambitious, scary and most of all brave. All great things start with an idea. You have a great idea then 99% of the work is done. Squad knew they would be learning as they went, but nurturing its employees and good ideas was worth it. But with great ideas, it started becoming grander in scope. Iteration after iteration, the game went from just launching a rocket, to recovering the rocket, to full on space flight and galactic exploration. And isn’t that how all real space programs started? Kerbal has a hugely active fan base. During its beginning stages, it rapidly gained a dedicated fan base that seemed to turn an eye to the parts of the game that were unfinished. Once it was released on Steam – a PC games platform – during the spring of 2013, it grew to be one of the top 5 best selling titles on the “early access” part of the site, which also earned it a new influx of players. The game is a work in progress with regular updates being released by Squad as well as the hundreds of ever hanging mods and additions available from the player community. 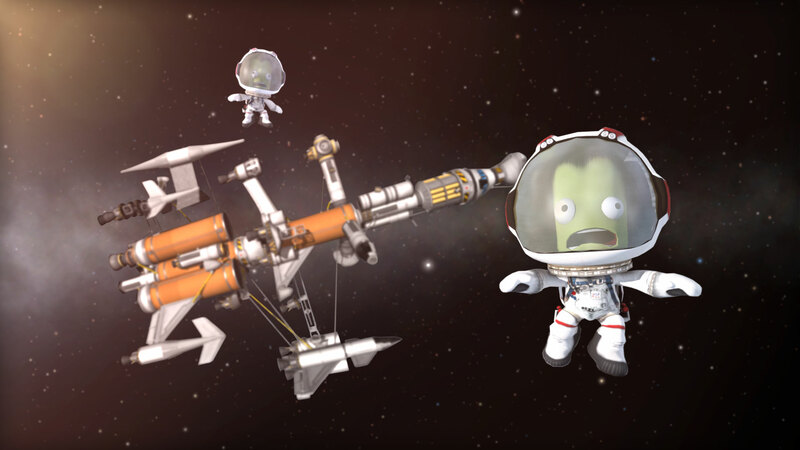 Squad, the creators of KSP, and NASA partnered to bring the Asteroid Redirect Mission into the game. Credit: Squad, Monkey Squad S.A de C.V. The game has an endearing and jovial touch to it. 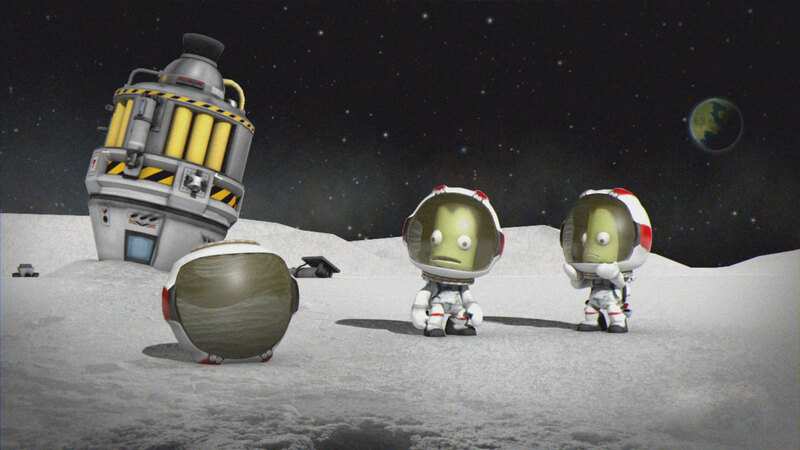 The workers in the space programs are actually little green characters called Kerbals. 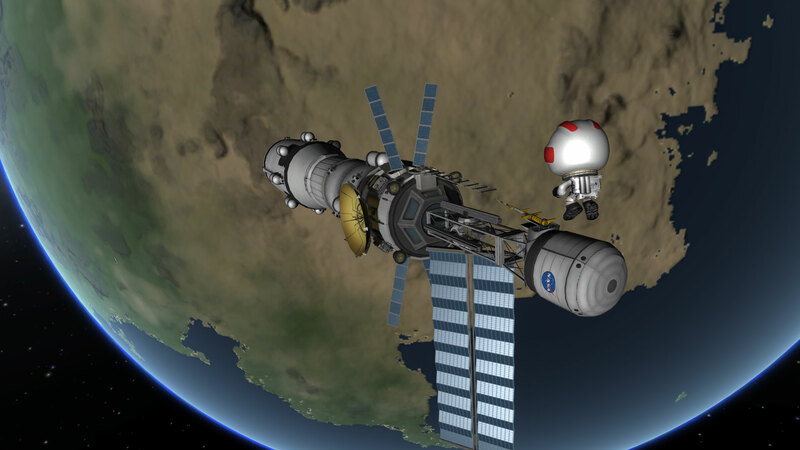 They operate the Kerbal Space Center (KSC), located on Kerbin – the world they live in. They write in English, but have their own language (a backwards Spanish known as “lonapsE”), that game players get to hear them speak when they are in the Astronaut Complex, in trailers for the game, or at the end credits theme. Everything about the Kerbals seems to be “Kerbalized” to really give the little green guys their own unique character description. Aside from a select number of Kerbals that are pre-named, the rest of the species is named using “Kerman” as the last name, and a first name built out of a mixture of phonetic syllables or words chosen from a list of supplied names to choose from. The Kerbal species is even called “Kerbalkind”. 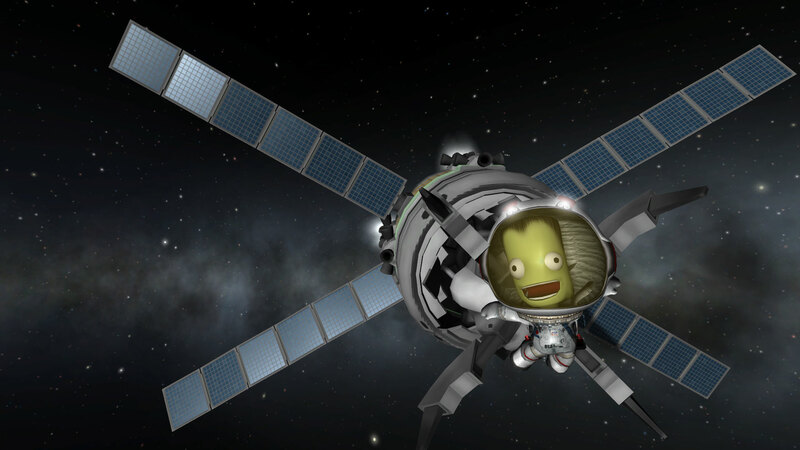 For the Kerbals that are astronauts manning the vehicles players launch, a casual fan-made name (though not an official dedication by Squad) was created – Kerbonaut. The Kerbonauts have randomized traits, and are the only characters in the game that can be controlled externally by players. Any Kerbonauts employed by the Astronaut Complex are listed, along with new Kerbonaut hirings. 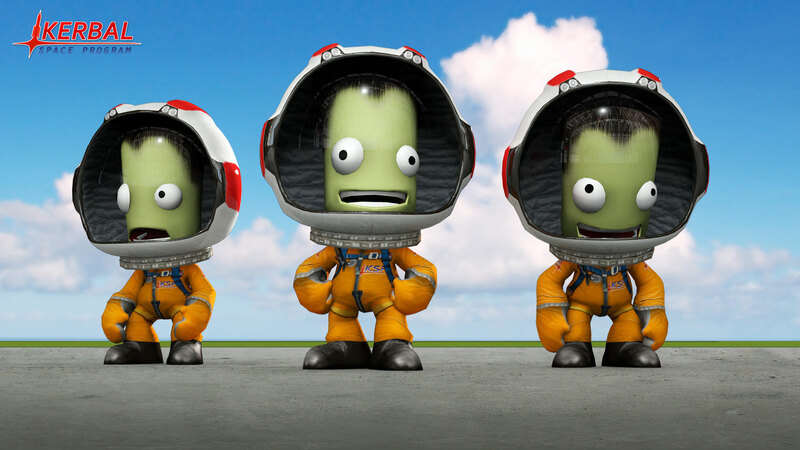 Jebediah, Bob, Bill, and Valentina are the Original Four astronauts in Kerbal, but you can create your own too. Credit: Squad, Monkey Squad S.A de C.V. When it comes to game play, whereas launching a rocket for NASA requires precise calculations and restrictive physics, Kerbal has a slightly easier learning curve. Your rocket needs to make sense, and the construction needs to be of quality. Fuel-efficiency, wind resistance, and thrust balance are all things that need to be taken into account. It’s just complex enough to engage the player mentally, and just simple enough that a single person could design a great rocket that doesn’t require a team of mathematicians and engineers. The physics of Kerbal Space Program aren’t anywhere near as unforgiving and restrictive as NASA has to deal with in real life, but your rocket still needs to be logical and well-constructed. There’s also a thriving mod scene that’s constantly creating new devices and toys for players to tool around with. Any planet or moon can be reached with the stock parts, however, the modding community has helped to make some missions easier. Some parts even have built-in telemetry tools that can automatically fire your engines for the proper amount of time and put you on the perfect heading. Rocket science and fun may not be words you often hear together, but KSP makes it so. Credit: Squad, Monkey Squad S.A de C.V.
“I’ve actually tried to land on Duna using the sky-crane method and I have killed many Kerbals along the way,” said Douglas Ellison, a visualization producer at NASA’s Jet Propulsion Laboratory. He’s one of the people who helps make JPL’s scientifically exact digital recreations of NASA missions like the Curiosity Mars Landing. Duna is the equivalent of Mars in the Kerbal universe, and Ellison worked to perfectly recreate the landing of NASA’s Curiosity rover on Mars which used the sky-crane landing method. A small rocket carrying the rover parachutes down to the Martian surface, then fires rockets to hover in mid-air before lowering the rover the rest of the way to the surface on a cable. To the average person, this may seem like a complicated mission to take on, but for someone that works for NASA and is constantly exposed to these concepts, the fact that above-average challenges can be carried out, is what makes the game so interesting. 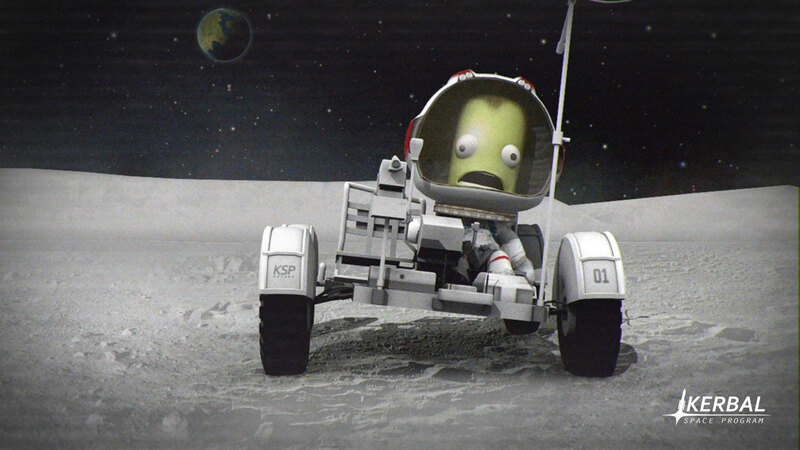 Like Earth’s astronauts, Kerbals enjoy driving around in their shiny new lunar rover. Credit: Squad, Monkey Squad S.A de C.V.
From an educational standpoint, Kerbal can give players a pretty realistic idea of what it really takes to build and launch a rocket and the science behind it. The game also helps players gain a whole new vocabulary when they are consistently exposed to words such as perigee, azimuth, and retrograde. NASA even partnered with Squad in 2013 to incorporate the Asteroid Redirect Mission into Kerbal. In real-life, this type of mission is the first of its kind. It’s purpose will be to identify, capture, and redirect a near-Earth asteroid to a stable orbit around the moon, making it more accessible for astronauts to explore it and return samples. It is part of a plan NASA created to advance new technologies and spaceflight experience necessary to pave the way for a human exploration on Mars. How does that translate into the world of Kerbal? Players are able to use true-to-life, NASA approved rocket parts. 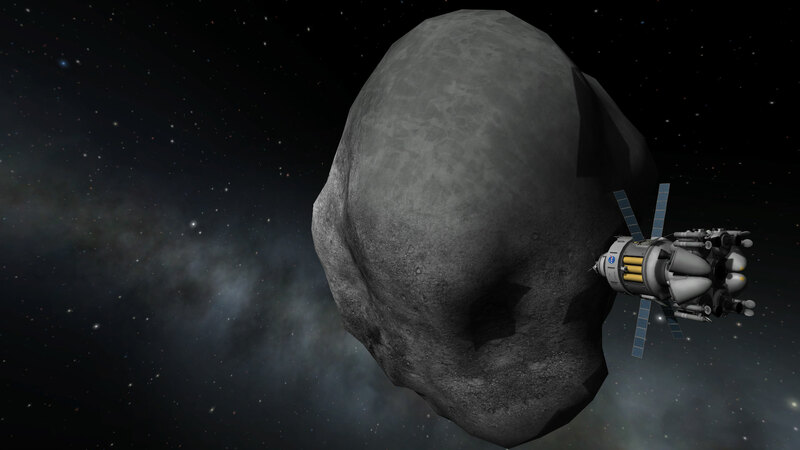 It allows players to work on capturing an asteroid or changing its trajectory to prevent it from coming in contact with planet Kerbin. 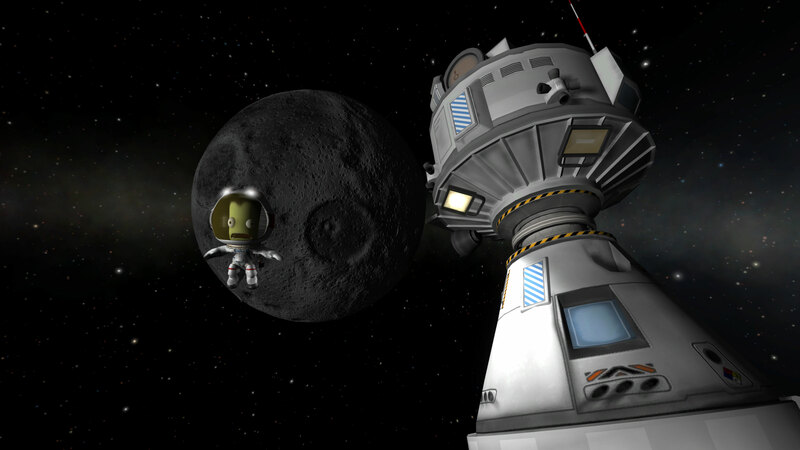 Kerbal Space Program allows gamers to design and build their own rocket-powered spacecraft and send them on missions across the solar system to moons, planets and asteroids. Credit: Squad, Monkey Squad S.A de C.V.
With realistic missions and such a broad array of knowledge players have to gain from Kerbal, it may end up playing a large role in the ignition of a passion for many people that otherwise would have turned a blind eye to STEM fields. In a time where too many people think that NASA operations ended with the termination of the shuttle program, Kerbal helps to spread the word that space exploration is still a booming field. It demonstrates that concepts of rocket science and space travel that many think they are not capable of understanding, are actually attainable. WIth a little work, dedication, and little green” Kerbonauts” to keep them company in their virtual adventures, a new generation of rocketry and space lovers may be an accidental product of Felipe Falanghe’s dream. Oh and Bob, my stranded Kerbonaut, he’s going to have to wait a little longer. Apparently ice-cream cone shaped rockets aren’t a good idea. Hope he has something to pass the time. This might take a while. Author Andrew Groen also contributed to this article. He is presently writing a book titled ‘Empires of Eve’, a history of the great empires of the Eve Online massive multiplayer online game. 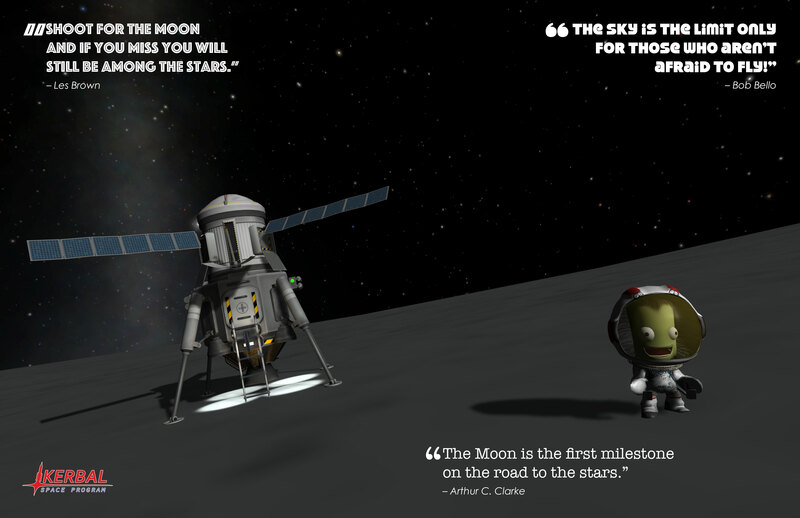 KERBAL SPACE PROGRAM MUN (Moon) POSTER. 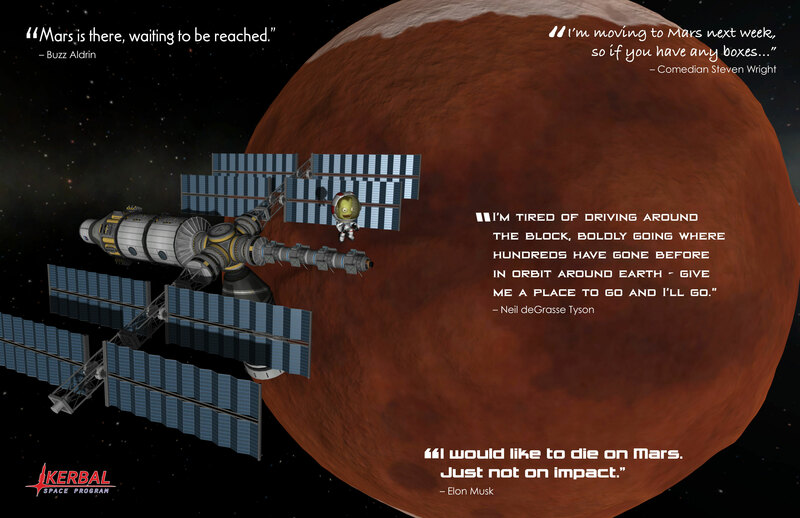 Credit: Squad, Monkey Squad S.A de C.V.
KERBAL SPACE PROGRAM DUNA (Mars) POSTER. Credit: Squad, Monkey Squad S.A de C.V.